Are you a photographer or a designer? In this case, you might want to show your work to other people that visit your website. Otherwise, what would be a website good for, if you can’t show the best of your work? BTW: If you don’t like reading all this stuff, skip to the end of the page to find a link to my Skillshare class that covers the same topic. In most cases, you can just set up a simple photo gallery. It is an excellent method to display your best images or designs in a collection of pictures. 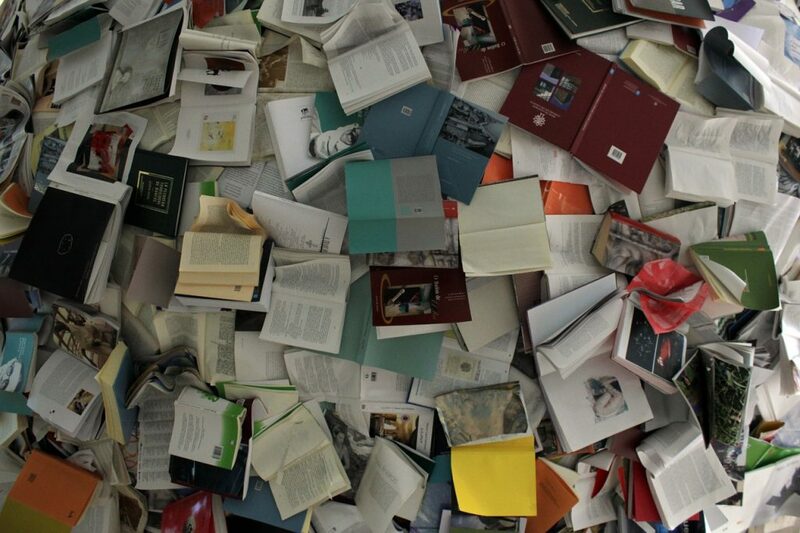 But in some cases, there is more to tell about your projects than a picture can show. For example, you often want to tell the story behind the project. You may also want to show how long you worked on the project and who your client was for this job (if the client is okay with that). Sometimes, the client will even give you some excellent feedback, which you can use as a testimonial in your portfolio (again, ask the customer first, if it’s okay to publish it). After I have searched for a good portfolio plugin, I have found a bunch of them. But after testing each one, I found some problems, flaws, and disadvantages on almost all of them. Some are difficult to set up and use. Others don’t have essential functionality that you need, for example using categories for your portfolio items. For some of them, you need to buy a paid version. But I wanted to find a free plugin that has all options that you need, to use it on a professional website. The one I found is named “Waving Portfolio.” It is entirely free and offers all options that are needed. Each portfolio item can have its own content so that you can tell the story behind your work and you can even add more images in the text. It also includes a built-in photo gallery, so you can attract your visitors to click on the portfolio thumbnail and check out all the detail photos in the description. 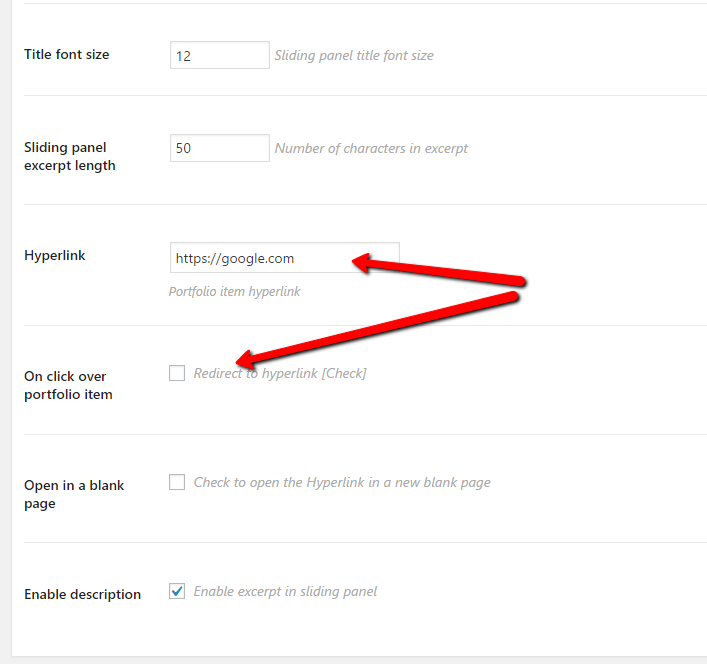 If you don’t want to add individual content to the portfolio element, you can just put a link to a website of your client, if you want to do that. And this can be done individually per element. 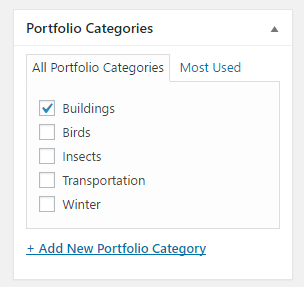 And you can assign categories to your portfolio items so that the visitor can filter the thumbnails which will show only the items that belong to the chosen category. This filter function also comes with a nice animation effect. After you have installed and activated the plugin, you will find a new entry in your dashboard named “Portfolio.” Click on “Add New Item” to insert a new portfolio element. It is just like a blog post. 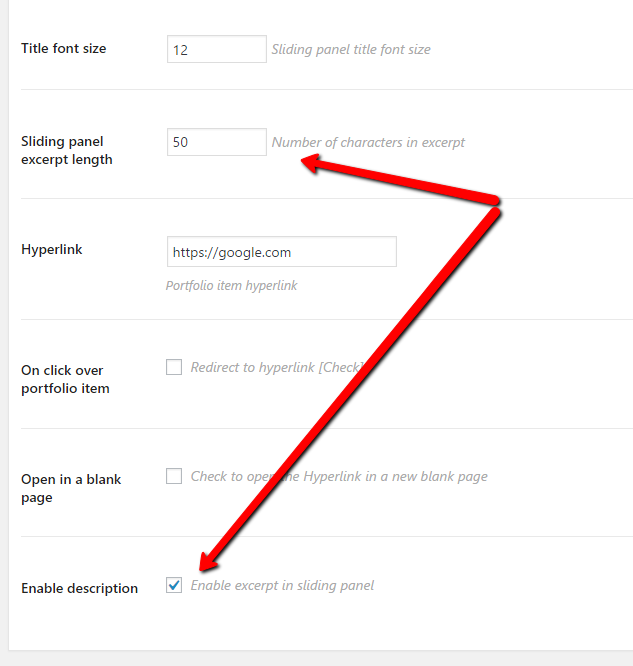 You enter a title, and you can also add individual content, just like for any blog post. Very important: You must add a featured image to your portfolio item. Otherwise, it will not show up on your portfolio page. Underneath the content editor, you will find some more options. 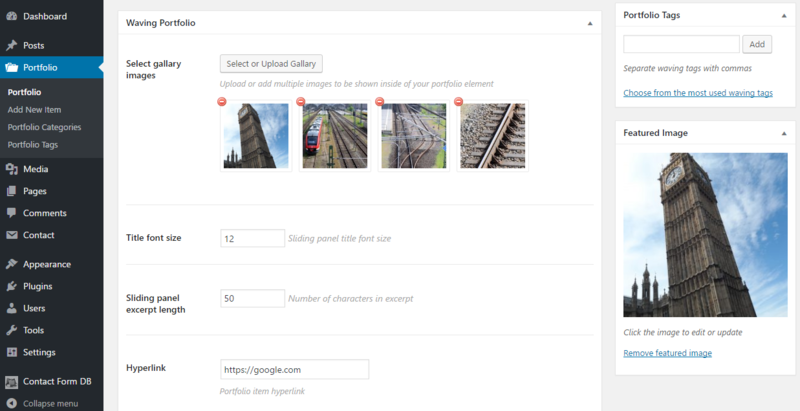 First, you can select more images, that will show up as image gallery when the visitor clicks on the portfolio thumbnail. If you want to enable the filter function later, you also need to select at least one category. These Portfolio Categories are independent of the regular post categories. For example, I have added categories like Birds, Insects, Transportation and Winter for my photographies. To insert the portfolio on a page on your site, just create a new page. I have created one and named it “Portfolio.” All the magic happens when you insert a particular shortcode and garnish it with some parameters. Here you can choose between a dark and light theme. The dark theme uses a dark green background color for showing the portfolio details. The dimension control fields are a bit misleading. You may fill out only one, because you need to decide if you want the size limited to a specific width or height. If you fill out both, the height parameter will be ignored. You can decide if you want to show the filter buttons including a button for “All” or if you just want to show the categories without the option to show all items. In the current version 1.2.4.5, there is a little bug. If you choose “Show categories” in the helper window, it will create the shortcode parameter showCat=”false” but you have to change that to showCat=”true” to work properly. I have reported this bug to the plugin creator so that it might get fixed shortly. 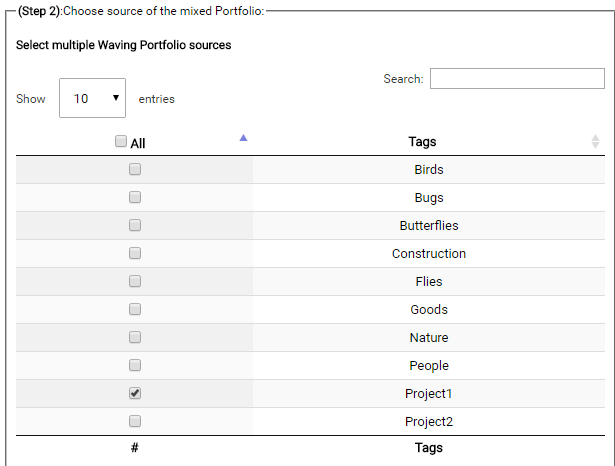 While the categories are used to enable filtering on the front-end, the tags can be used to decide, which portfolios are shown on the page. For example, you can create tags for each client. I have added tags like project1 and project2 so that I could add them to some of my portfolio items. If I want to show a portfolio just for all the works in project1, I use the tag parameter to show only these portfolio elements. The Waving Portfolio is a nice lightweight and easy-to-use plugin that you even get for free. I found it the fastest and easiest way to add a portfolio to a website within a few minutes.